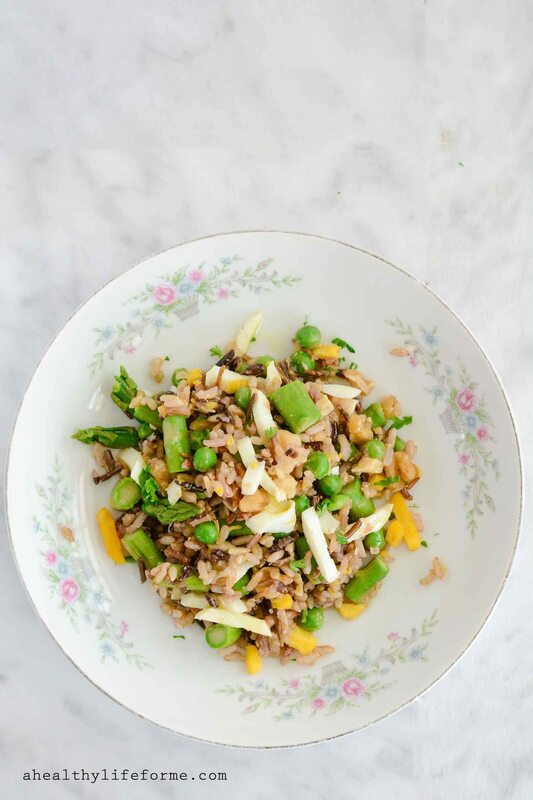 Spring Rice Salad is a fresh tangy and light recipe that is ready in 20 minutes and uses fresh seasonal asparagus and peas. The perfect salad to enjoy all spring and summer. Happy Happy Monday, I can not believe we are into the last week of April. It has definitely been all about April showers, so I am very hopeful that we will have a lot of May flowers. With all those showers, I am way behind on planting my vegetable garden. However, at the farmers market there has been plenty of fresh spring produce for me to enjoy. I think asparagus is probably my favorite spring vegetable, and I have definitely been eating my fair share. This salad is bright, tangy, gluten free and dairy free and really showcases the great flavor of those green spears. To keep the recipe gluten free, there are several wonderful gluten free brands for you to choose from. My husband loves wild rice, me not so much. To make a trade I found a great mixed rice blend. You can use whichever rice that you enjoy in this recipe you could also substitute with quinoa if you want to add a bit more protein. Return the saucepan to the heat with about 1/2” of water and bring up to a boil. Salt the water and stir in the asparagus and peas and cook for just about 1 minute, just long enough for them to brighten up and lose a bit of their bite. Drain and run under cold water to stop the cooking, and add to the rice. To the rice, asparagus, and peas add chives and 1/2 cup of the walnuts. Add the garlic, salt, lemon juice, and olive oil together and whisk to combine. Drizzle on 1/2 of the dressing and toss to coat. Taste and add more dressing to your liking. Before serving gently toss in additional walnuts and chopped egg. 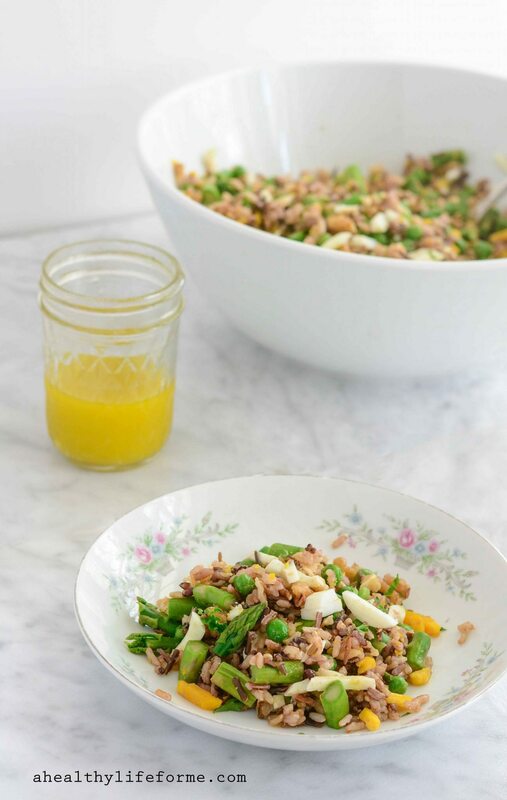 Love this colorful, simple and flavorful spring salad! I hear ya…we better have lots of May flowers with all these storms and showers! And this salad is so colorful! Love it! Meg, Bring on those flowers us girls deserve them after all this rain! Blah! This salad is just what I need to pair with the chicken in the fridge! Also, what is your pretty backdrop surface? A marble slab? So gorgeous!! Thanks Beth. That backdrop is actually Laminated Vinyl Tile from Home Depot that I adhered to foam board. One side is carrerra marble look a like and the other is slate. This salad is so fresh and perfect for spring. The bowl you used for your salad is perfect! So pretty. Thanks Brandy, I love a rummage through second hand shops for plates, bowls, etc. This beautiful bowl cost me a whopping 50 cents. 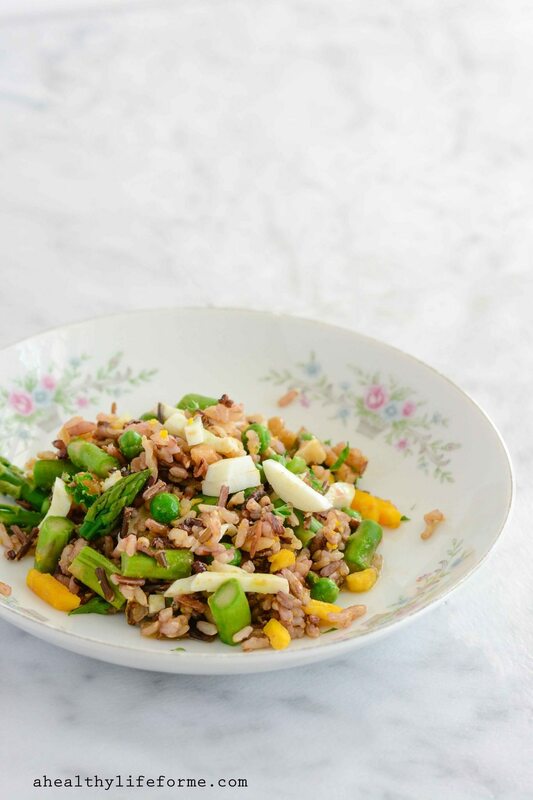 Lily, Rice salads are always great as a side dish with almost everything. Enjoy! This looks so lovely, light, and healthy! I think asparagus is probably my favorite spring veg, too…as well as fresh, tender baby leafy greens. This could definitely be my make it once and eat it for lunch all week salad! So pretty! Thanks Courtney, unfortunately there were no leftovers everyone had seconds, but next time I will make extra! Love everything about this salad! It looks so fresh and fabulous! Would be perfect for lunch or as a great side to grilled chicken. I served along side of a chicken dish and it worked perfectly! This is a lovely salad. I wish you could send some of those showers to San Francisco. We are still in a drought over here! Oh I wish I could send that rain to you too Andi! Loving the flavors here and the addition of rice. I’m going to have to give this recipe a try. I hope you do Connie. It is delicious!